Eating clean during the festive season is impossible. Well, almost. Bakery cafe chain Cedele, which is all about healthful eating, has created the Vegan Chocolate Berries Pie ($50, above), for the season. Before you turn your nose up at the thought of a vegan chocolate pie, let me tell you that it is very good. The filling is lush, creamy and chocolatey, sweetened with organic unrefined sugar. Most of my colleagues ate it without even knowing that it was a non-dairy pie made with organic sprouted tofu and 70 per cent dark couverture Belgian chocolate. And no, there's no dairy in the dark chocolate - the cocoa butter in it refers to the natural fat from cacao beans. The pie base is crisp like a wafer, made with only rolled oats and olive oil. It is the perfect dairy-free and gluten-free dessert for the holidays. But don't tell your guests that the pie is vegan - tell them only if they pick up on the ever-so-subtle and almost non-existent aftertaste of the tofu. Even then, tell that discerning guest to keep it hush. INFO: Order online at cedelemarket.com.sg. Orders must be placed at least two working days in advance, before 2pm. For more information, e-mail orders@cedeledepot.com or go to www.cedelegroup.com for more information. 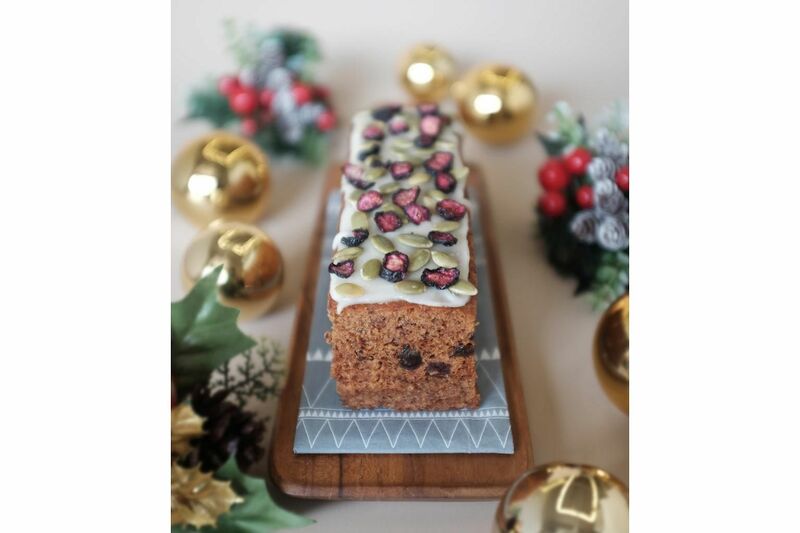 For a boozy fruit cake made with just raisins and dates, try Sunday Folks' Holiday Brandy Fruit Cake (from $18 for a small whole cake, $32 for a larger cake or $8 a slice for dine-in customers). The moist, bouncy cake has the texture of a sticky date cake without the sickeningly sweet caramel toffee sauce. The brandy hits you in the first bite and there is certainly no shortage of it. I also cannot get enough of the cafe's housemade Dark Chocolate Sea Salt Honeycomb, a sweet-salty crunch that is lovely on its own, with a cup of coffee. Also be sure to try the limited edition Little White Rabbit, freshly churned soft-serve ice cream which is inspired by White Rabbit Candy and served with soft, chewy lumps of housemade milk mochi and a sheet of edible glutinous rice paper. Childhood memories will come rushing back after that first lick. WHEN: The fruit cake, chocolate honeycomb and Little White Rabbit soft-serve are available from now until Jan 6.